The Moon is not the same place as when astronauts last stepped foot on it. 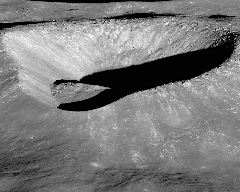 A New Moon Rises features amazing, large-scale, high-resolution photographs of the lunar surface taken between 2009 and 2015 by the Lunar Reconnaissance Orbiter Camera (LROC). These images provide unique visual data to help answer our questions about the Moon's formation, its continuing geological evolution, and its relationship to Earth and the solar system. A New Moon Rises includes over 50 photographs, three videos, one interactive, and files to produce seven additional images, five 3-D models of craters, labels and environmental wall vinyl. Displayed at the Smithsonian's National Air and Space Museum in 2016, the exhibition was organized by the museum and the LROC team at Arizona State University.